Really? A day to celebrate handwashing? Have the day-namers gone too far? Not in the case of Global Handwashing Day. Handwashing can save the lives of millions of children and newborns each year. In fact, your health and prosperity are due, in part, to this simple action. Every time your mother, father, or teacher told you to wash your hands when you were young, they were encouraging a hygiene habit that hundreds of millions of people still don’t have the privilege to practice. Handwashing helps to stop the spread of preventable diseases and infections, like diarrhea and pneumonia. These illnesses claim the lives of millions each year, fill up hospital beds, decrease household incomes, and put education out of reach. Where people wash their hands, people flourish. Where they don’t, people suffer. Currently, pneumonia and diarrhea claim 1.7 million children under the age of 5 each year. The simple act of washing hands with soap at critical times can reduce these illnesses by half. In a recent study in Nepal, when mothers and birth attendant washed their hands with soap, the baby’s risk of death decreased 44%. When children have access to handwashing devices, school enrollment also increases. (Learn more on the impacts of handwashing in our WASH Report). Every day is handwashing day at Lifewater. We work with families, communities, and schools around the world to make handwashing possible. Our WASH Promoters reach households with knowledge about how to build water-saving handwashing devices with locally-available materials. They also work at schools to train teachers and students about the importance of handwashing. Children are usually the first adaptors and bring their knowledge home! In many cases, the handwashing device is called a tippy tap and it is made from empty bottles, sticks, and string. In fact, every certified Healthy Home must have a tippy-tap in use, and family members must use it at the most important times to wash hands: before eating, before preparing or serving food (including breastfeeding), after using the latrine, and after helping a child with toileting or handling feces. Lifewater works in West Arsi, Ethiopia, where 1 in 5 people are under age 5 (the most vulnerable to water-borne diseases) and about half of children ages 5-12 attend school. In West Arsi, only 1% of handwashing devices had clean water and soap (or ash) available for use at the beginning of the project. Today, there are 300 certified Healthy Homes in the region. In Kaliro, Uganda, only 12% of households had an effective handwashing device, and one in three children under age 5 was suffering from diarrhea. Today, there are 149 Healthy Homes, with a goal of reaching 3,500 homes and 30,000 people in Kaliro. 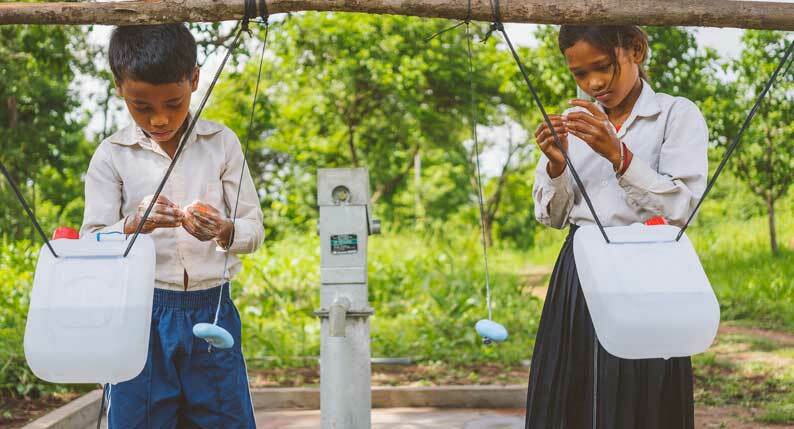 In Svay Leu, Cambodia, 1% of households had an effective handwashing device, and half of young children were suffering from diarrhea. Lifewater is working to reach 3,300 homes in this economically disadvantaged area of Cambodia.